Working on the day/night cycle, more effects to be added and a new healing powerset to be added. Login test, one powerset to be revised and one added. A new mission map to be added and some lighting changes. More costume testing, a look at controller and debuff powers and preparations for raid testing. In Q3 the dev team wants to enable players to test some kind of raid situation. Testing raids in Alpha is unheard up for MMOs. 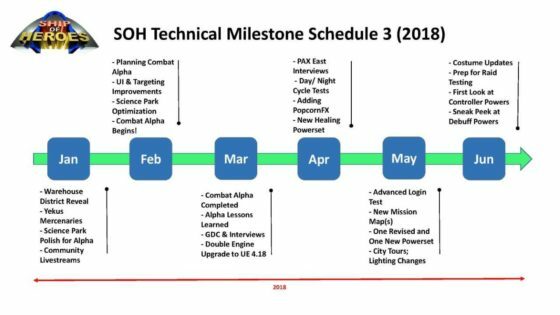 The plan, currently, is for Ship of Heroes to enter some form of beta testing phase towards the end of 2018. Although we have not officially been given a release date, we're anticipating (hoping!) 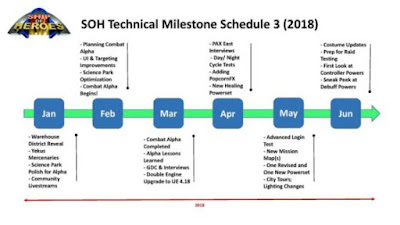 that the game will be released as a full fledged MMO some time towards the end of 2019.